WESTVILLE – Pastor Dave Delaney of St. Paul’s UMC in West Deptford joined Dee and Ish, the owners of the Piston Diner in Westville to sleep in cardboard boxes on the street on Oct. 26. They did so as part of a nationwide demonstration on behalf of Covenant House, a nonprofit organization serving homeless young people in the U.S. and Canada. In an effort to raise awareness of the plight of homeless youth, Delaney took to the street and documented his experience on social media, reaching hundreds of friends and followers. Since 1972, Covenant House has been opening doors to homeless kids and now stands as a powerful human rights movement for vulnerable youth in 31 cities across six countries. For more than four decades, the organization has helped transform and save the lives of more than 1 million homeless, runaway and trafficked young people offering support services to those in need. On the night of Oct. 26, Delaney raised over $2,500 through an outpouring of small donations, many of $10. Joan Tapken Benedict posted pictures to her Facebook account of Delaney setting up his cardboard box outside the Piston Diner. After many years working with teens, the cause has inspired Delaney who has no problem begging friends for support. Having seen, listened to, and held young men and women in their late teens and early twenties living out on the streets and officiating at their funerals, Delaney said he knows that each person reached by Covenant House has a chance to survive. 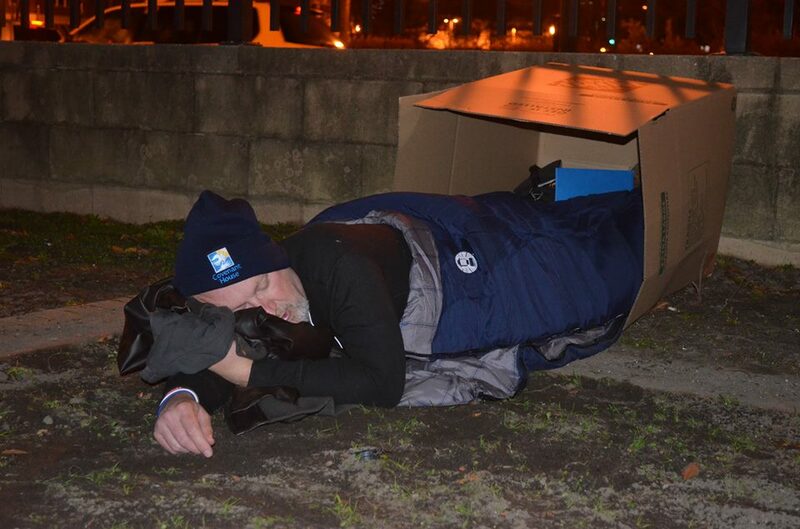 For the last five years, Delaney has slept out to raise awareness and funds for the cause he’s passionate about. This year, he expanded the sleep out because his friends decided to join him as a preview to Covenant House’s national sleep out on Nov. 16-17, where Delaney will sleep out on the streets of Atlantic City.